This past Sunday my wife & I took our 2nd DollyWood trip of the season. It was a blast, and perhaps even more fun than the first trip we took a while back. We rode tons of rides (Daredevil Falls being my favorite), and really enjoyed ourselves. The great news is that I did not have 1 single heat hives attack, which was really nice. I did get the sensation like I may have an attack, but it never happened. UPDATE: The remainder of the post below is an old archived post. I now would never dare eat a donut from Krispy Kreme (as delicious as they are!). I now stick to my diet quite rigidly. Nevertheless, I have left this post here in case anyone wants to drool over these donuts! Update on My Diet: I Have Been Eating Everything! My digestion and stomach issues have been 100% gone. I have eaten my 2nd pizza now (which is the best pizza in the world), and I had no stomach issues at all. I also recently tried my hand at some Krispy Kreme donuts. The powdered blueberry are my favorite, and I also love the plain glazed. 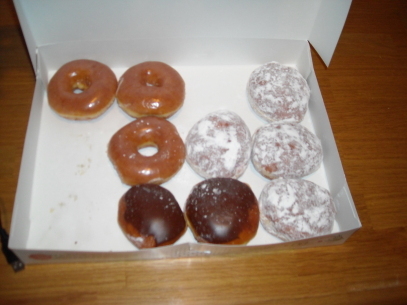 Sorry if that pic makes you hungry, but Krispy Kreme makes the best donuts ever!! Far better than any other donut company. I have missed them, and it has been several months since I last had some of those. Anyway, my stomach has been able to take on anything and everything I have thrown at it. I am still taking my Digestive Advantage, and that is like a miracle for me. I have been getting regular sun exposure, which has felt great. I couldn’t get sun for the past 2 days due to cloudiness (although I did go outside for a few minutes). But overall, I think the sun has really helped the hives, and made me feel better. I am going to get some more sun today. Again, I am being very cautious to avoid a sunburn or anything like that. The idea is to just soak up some natural rays without over-exposing myself. As far as the hives, they are still the best they have been in months. I have sweat a few times, and I have not had a bad attack in a while now. Don’t get me wrong, I know they aren’t permanently gone at this point, but I am SUPER OPTIMISTIC about the potential for them to go away. For the first time in a long time I have serious hope that I can get them under control and I will over-come these hives in the next year. I honestly think regular sun exposure, sweating, and keeping my digestion in line will eventually cut the hives out of the picture. This isn’t going to happen over-night, but I think over the course of a few months, they will be as good as gone. There have been tons of posts on the cholinergic urticaria forum with people indicating their hives are much better, and even completely gone after being outside more and sweating frequently during this recent summer. Even if the hives only went away for the 5-6 month hot season and returned in the winter, I could definitely manage that. I just want to be normal and sweat as much as I possibly can, and I think I will be able to do that (if only during the hot months). I still look forward to when I will get a house over the next few months, because then I will really be able to ensure I not only get sun exposure daily, but I will also be able to exercise and sweat daily.